Q1. I cannot log into the system. Q2. I forgot my Password. Q3. Is this website also available in Japanese? Q4. We are planning to submit a manuscript to SPring-8/SACLA Research Report and other journals. Q5. Do I need to prepare anything in addition to the manuscript file for online submission? Q6. What should I name the WORD files? Q7. How is the receipt date determined? Q8. How long does it take from submission to the receipt of the review results? Q9. I would like to withdraw my manuscript. Q10. Where should I submit the revised manuscript? Q11. I will not be able to submit the revised manuscript by the revision deadline. Q12. “R1” has been added to the Manuscript ID. Q13. My WORD file of an unsubmitted manuscript is lost in the system. Q14. I would like to add coauthors. Q15. I cannot revise the submitted manuscript using the menu for submitting a revised manuscript. Q16. Where to download the file with comments from co-editor. 【Q1】I cannot log into the system. 【A】Create an account in the SPring-8/SACLA Research Report online submission system. For details, refer to the Guide for submission. 【A】Use Password Help. An e-mail message will be sent to you. Set up a new Password in accordance with the instructions in the e-mail. 【Q3】Is this website also available in Japanese? 【A】It is only available in English. However, you can input Japanese characters in the input fields. 【Q4】We are planning to submit a manuscript to SPring-8/SACLA Research Report and other journals. 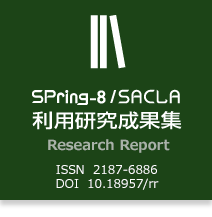 【A】Once you have submitted your manuscript to SPring-8/SACLA Research Report, you cannot submit it to other journals (prohibition of duplicate submission). For details, refer to Notes on submission and SPring-8 User Information/SACLA User Information. If you have any questions, please contact the Office (e-mail: sp8r3p@spring8.or.jp). 【Q5】Do I need to prepare anything in addition to the manuscript file for online submission? 【A】Upload the Proposal Application (PDF) as a proposal with your manuscript file. You can download the Proposal Application for your research proposal on My Page of the SPring-8/SACLA UI Site. For the download method, read the manual for downloading Proposal Application. 【Q6】What should I name the WORD files? 【A】Single-byte English and number characters are preferable for the names of files. 【Q7】How is the receipt date determined? 【A】You will receive an e-mail message once you submit your manuscript. Confirm the receipt date given in the e-mail message. 【Q8】How long does it take from submission to the receipt of the review results? 【A】In principle, it takes approximately two months. It may take longer than two months depending on the review condition. The co-editor or the Office will notify you by e-mail as soon as the review is complete. 【Q9】I would like to withdraw my manuscript. 【A】Contact the Office (e-mail: sp8r3p@spring8.or.jp) to withdraw a submitted manuscript. 【Q10】Where should I submit the revised manuscript? 【A】Read the manual for submitting a revised manuscript and submit it by the revision deadline. 【Q11】I will not be able to submit the revised manuscript by the revision deadline. 【A】Contact your co-editor or the Office (e-mail: sp8r3p@spring8.or.jp). 【Q12】“R1” has been added to the Manuscript ID. 【A】When you submit a revised manuscript, R1 will be added to the Manuscript ID that was assigned at the time of your first submission. 【Q13】My WORD file of an unsubmitted manuscript is lost in the system. 【A】When a WORD file is not updated for more than 30 days after uploading, the file will be deleted from the system. To submit the manuscript, upload the file again from File Upload. 【Q14】I would like to add coauthors. 【A】Contact the Office (e-mail: sp8r3p@spring8.or.jp) if you wish to revise the submitted manuscript. It is not possible to add coauthors using the menu for unsubmitted manuscripts. 【Q15】I cannot revise the submitted manuscript using the menu for submitting a revised manuscript. 【A】If your revision deadline has passed, you will not be able to revise your manuscript. Contact the Office (e-mail: sp8r3p@spring8.or.jp). 【Q16】Where to download the file with comments from co-editor?